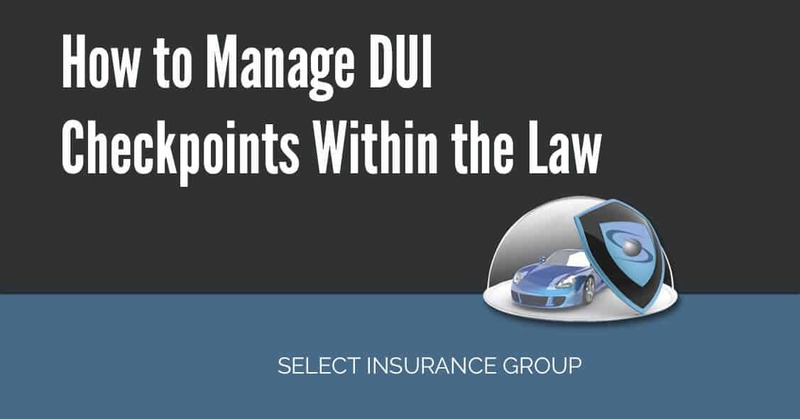 How to Manage DUI Checkpoints Within the Law – Select Insurance Group provides affordable liability certificates to high-risk drivers, and works with clients to minimize the risk for further convictions, while supporting improved driving behavior. There are an increasing number of locations where police officers are setting up checkpoints to test drivers for intoxication. Currently it is legal for police to stop vehicles to test drivers in 38 states, DC, and two territories. Eleven states have laws that make such stops illegal, while Texas has legislated that such checkpoints are in breach of the Constitution. In these states, legislators have deemed that such checkpoints infringe on personal freedom. In the parts of the US where such check points are legal, different state laws mean that there are variations in how the checkpoints are operated. The increase in the number of checkpoints is perceived by some to be a major impediment to drivers reaching their destinations in a timely manner. Warren Redlich, a lawyer from Boca Raton, FL, claims that some police officers are able to charge drivers with DUI even if they pass a breathalyzer test. According to Redlich, police officers may charge you if they claim that they can smell alcohol on a driver’s breath, or if they claim that the driver is slurring his or her words. As laws differ on a state-by-state basis, the flyer specifies the relevant legislation for each state. While flyers are not available for all states, the website is gradually producing them. Currently, they are available for Arkansas, California, Georgia, New Jersey, New York, Ohio, South Carolina, Texas, and Utah. Redlich notes that simply by opening the car window, the driver provides the opportunity for a police officer to smell their breath. If requested, drivers should produce their license and registration, and hold them up to the closed window to ensure that the police officer can review the validity of the documents (which is a lawful order). The aim of having the information printed on a flyer is to allow the message to be communicated to the police officer without the risk of speaking, as an officer could claim that the speech was slurred. Once drivers who have been convicted of DUI (or associated charges such as DWI, DWAI or Wet Reckless) have their license reinstated, the law requires them to have an additional license validation with them while driving – the SR22 Form. The conviction will have cost the driver significantly (due to legal costs, additional transport costs, and the costs of higher insurances). A repeat offense will cost the driver even more. In a similar way, drivers who are identified as high-risk for insurance purposes due to other convictions should consider every opportunity to legally minimize the risk of further convictions, while staying within the law. Such convictions could include being at fault in an accident, driving without insurance, multiple traffic offenses, or any suspension related to a traffic violation. While DUI should never be condoned, drivers are within their rights to take legal steps to minimize the risk of a further conviction. Select Insurance Group aims to ensure that drivers are aware of their rights, and use appropriate legal options to minimize the risk of further conviction. Newer What If You Can’t Afford an SR22?